Graduate study programme which requires a first university degree. The MA in Sociology offers a research-oriented study programme with focus on present-day issues and challenges. Such key themes are often subject of international comparative studies: migration and social integration, gender inequalities in organisations and labour markets, education and labour markets, organisation and the economy, culture and social networks. In order to discuss these themes,, a knowledge of general theoretical foundations and their skilful application is essential. To promote interdisciplinary exchanges, the study programme foresees joint modules with anthropology..In addition to this, we put a strong emphasis on teaching our students how to apply methodical ‘tools’ and enable them to collect and analyse empirical material. The core of the research-oriented study programme is formed by a two-semester project seminar and the final thesis. Students are specifically included in current sociological research and mentored to reflect on societal developments. Our students also take part in sociological research colloquia and are introduced to the sociological debating culture. Why study Sociology at Konstanz? ideal foundation for a subsequent doctoral programme, for instance at the Konstanz Graduate School of Decision Sciences. After the master's programme you can continue with doctoral studies in Sociology and acquire a doctorate (Dr. rer. soc.). Sociology is involved in the Graduate School of Decision Sciences (GSDS). 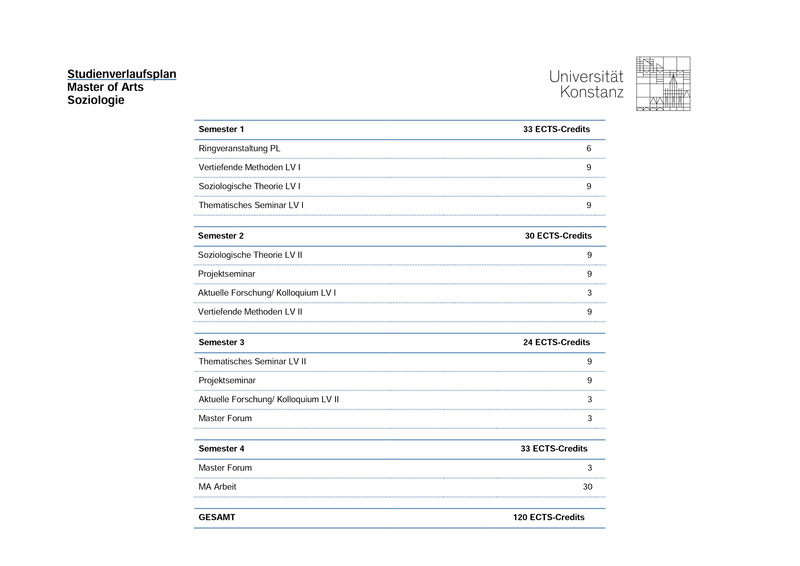 You can find an exemplary structure of the study programme in this table (in German). An internship outside the university is not mandatory, but always highly recommended. The department's Internship Office or our Career Service will help you to ind a suitable placement. We highly recommend a study abroad stay. The university promotes study abroad via Erasmus+ and numerous other exchange programmes. International applicants need documentation of their German language skills, level DSH-2 or TestDaF 4. Alternatively, other language tests or school certificates recognized as equivalent can be used as proof of the required German language skills. The language usually used in class and during examinations is German. Courses may be taught in English. Course work and academic performance assessments in these courses can be completed also in English. letter of motivation (two DIN A4 pages or more) stating why you choose the Master's Programme in Sociology, your expectations and aims for the study programme. International applicants need documentation of their German language skills, level DSH-2 or TestDaF 4, or a language test recognised as equivalent. This study programme has no admission restrictions. Important note: Please note the information provided under the tab "Admission requirements". Join us to learn in small seminar groups and enjoy personal and individual supervision. You can pursue your research goals, implement your ideas and actively shape your career. Come study with us, it's worth it!